Carl monitoring fragile alpine flora. Introduction: Carl, of Randolph, NH, has enjoyed hiking since childhood while on vacations with his family. Over time, his passion for the outdoors became a major part of his life. He has been an avid four season hiker for six years, his acumen honed mostly by his experiences and professional work in the Northern Presidential Range of the White Mountain National Forest. Two years ago, he began working for the Randolph Mountain Club as a backcountry caretaker for the shelters on Mt Adams. This move blossomed into a life of its own, and he now wears many hats around the White Mountain community. 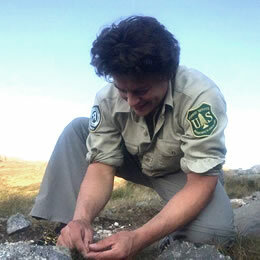 Carl has invested a lot of time into alpine botany research, wilderness emergency response training and caring for the trails. In addition to his passion for hiking, Carl also enjoys snowshoeing, backcountry skiing, birding and photography. The Triple Crown challenge is one of Carl’s favorite sunny day activities (three ravine trails in one day involving two ascents and one descent). Résumé: Carl has been working in the rugged backcountry of the Northern Presidential Range for two years. His work has included four seasons of caretaking out of the shelters on the North side of Mt Adams (with two more seasons on deck), a summer in the alpine zone performing technical trail work with grip hoists and skylines (training provided by the US Forest Service), as well as ongoing volunteer work with search and rescue units and alpine stewardship. His efforts and ability to direct and carry out projects in the backcountry earned him a spot on the RMC Board of Directors, as well as recognition within the community. The consistency of his work has turned his outdoor experiences from recreational outings into a true lifestyle. He has successfully completed 5 winter Presidential traverses, over 30 winter ascents of Mt Adams, and countless miles in the alpine zone during all seasons, many by nature of commuting and profession. Carl has also enjoyed four season hiking in the Green Mountains of Vermont as well as New York State’s Adirondack (ADK) Mountains. Certifications: SOLO Wilderness First Responder (WFR), AHA CPR/AED, Androscoggin Valley Search and Rescue (AVSAR)- Winter Team, US Forest Service Volunteer Alpine Steward, Randolph Mountain Club veteran backcountry trail crew and caretaker. A: The whites have always been a symbol of freedom for me, as I would imagine it is for others who center their life around these mountains. Away from traffic and cell phones, at peace with my immediate environment and focused on the challenges at hand, I feel truly alive, and in the moment. A: I wish more people had the time to invest in recreating outdoors.. it has been such a source of wellness for me! There has been lots of research indicating that hiking is good for the heart and the mind, and it doesn’t surprise me one bit. A: Enjoy your time here. It sounds simple, but oftentimes so much thought is occupied by anticipation, or zeal for the lofty summit goal, that we can forget that we are in such a truly different place. There is so much to learn from the extreme landscape, and with so much beauty at every turn, it is best to just let yourself enjoy your surroundings. Try to read as much into this world as you can while you are here. A: To the world? Tread lightly! The mountains are a special place, and a very rare environmental resource. With the enormous upward trend in hiker traffic, we must all do our part to leave the place better than we found it. Stay on the trails, off the alpine plants, and pack out all of your trash. Inform yourself beforehand of local and federal camping regulations, and hike well prepared for the season and weather. Education in these matters has always been an issue, so help reverse the trend and leave no trace!